Oh, The Holidays Are Upon Us! It has been crazy in the Engledow house! 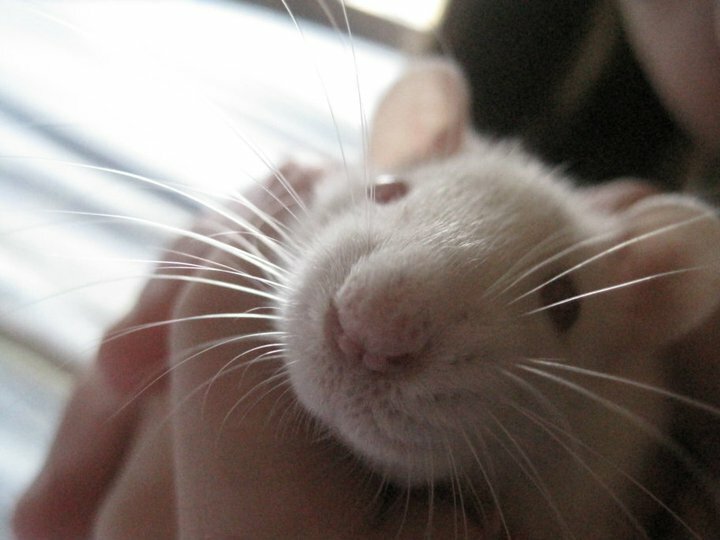 There has been a lot happening: Jenni’s very first turkey, the arrival of Jahmal and Dexter (the parakeets), the hubby’s birthday and the preparation for the imminent arrival of Marshmallow (the rat). I hosted my very first Engledow Thanksgiving this year. My mom-in-law, who is usually the hostess, had back surgery and just couldn’t do it this year. There was a lot of whispering, “Who’s gonna host it?”. There is a maximum of 21 family members so it’s no small feat. However, I’m 45 years old and have NEVER made a turkey, so I took this as a sign that it was time. I told my husband that I was ready so let’s do this thing! There are TWO cavities in a turkey, NOT one. I’ve heard the horror stories about people leaving the bag of goodies in the turkey and I did not want to be one THOSE. So, I unlock the turkey from his plastic shackles and look in the “cavity” for the goody bag. Um, okay, I see the neck, but where’s the other “stuff”? I ask Rachel and Maddie to look in the bird – did I miss it? Am I going blind? The girls confirm that the cavity is empty. I’m confused (maybe my bird did organ donation), but I move on to the wash and dry part of the process. I’m holding this slippery 12.5 lb turkey in my kitchen sink so I can rinse the sucker. This is harder than it looks! As I’m rinsing, I find another “cavity”! The bag of goodies is stuffed in the turkey’s rear end! No one told me (and I didn’t read anywhere) that there were TWO hiding places for extra turkey parts. Now, I completely understand how those parts get left in the turkey. Can’t we put them in one spot and not turn it into a scavenger hunt? Thankfully, I did not drop the bird, but my apron was covered with the butter. I had to kind of hug the bird to flip it – I’m glad there wasn’t a video camera around! Dry the bird REALLY well before applying butter spread. Yeah, the butter wasn’t sticking very well and my hands were caked with the butter spread. It was a mess, but some of the flavor was still there. Thank goodness! This practice bird actually turned out really well – nice and tender. Yum! For the actual day, I made two 13.5 lb turkeys for 17 people. The night before, I successfully found all extra turkey parts, washed and THOROUGHLY dried my turkeys and stuffed the cavities. I put them in the turkey oven bags and back in the fridge. In the morning, I pulled them out, put them in the roasters, made sure (again) that the skin was dry and THEN applied my butter spread. Everything went smoothly and the turkeys were really well received. I would call my very first Thanksgiving a success – Whew! 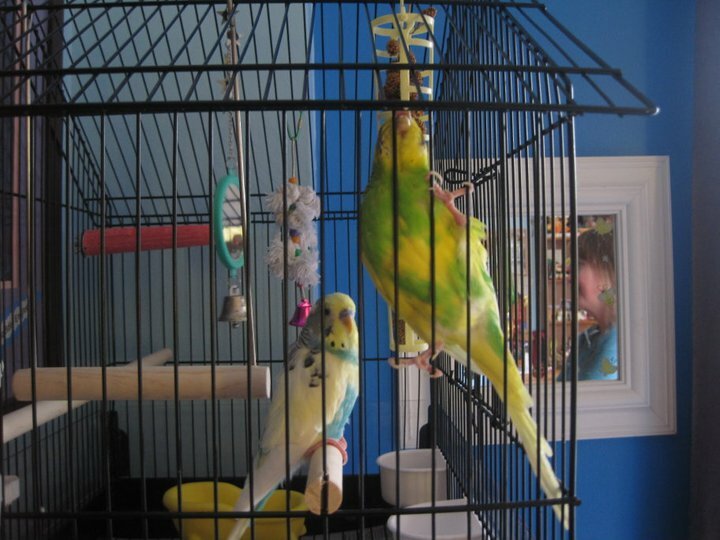 Jahmal and Dexter seem to be getting used to their new home and you can hear them chirping and squawking all the way downstairs – I actually don’t mind the noise. And, we have started the countdown until the arrival of Marshmallow. 7 days and counting………she arrives on December 14th. We had a great celebration on Sunday. He got this Frank Lloyd Wright wall hanging that he has had on his list forever – this was his lucky year! Mushroom Soup a la Ina Garten, and wedge salads. Maddie made her daddy homemade gingerbread men cookies and also a blondie brownies. Everything was delicious! Isn’t this crazy? 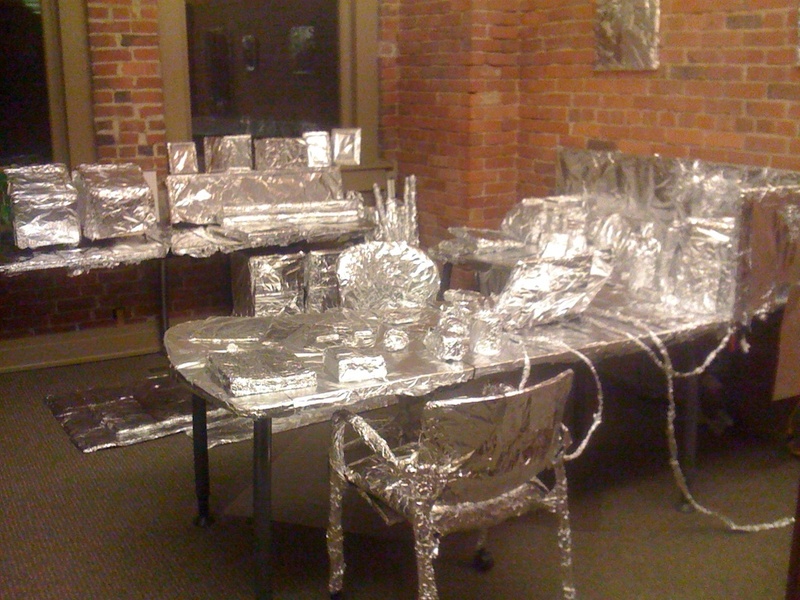 His office manager (with some help from other staffers) did this to his office over the weekend. He said that he got about half of it unwrapped yesterday. EVERYTHING was wrapped, even the pens, pencils, sticky notes, etc. were individually wrapped! Happy Birthday! Now you’re up to date on the Engledows. As this month moves forward, there will be more good stories to share……. This entry was posted in Everyday Life and tagged birthday surprises, holidays, office pranks, pets, thanksgiving, turkey. Bookmark the permalink. The aluminum foil is indicative of so much love for you hubby. He’s blessed with good friends! He still better have that report on the boss’s desk by 9am or there will be heck to pay! And I think I see a family resemblance to Marshmallow. Maybe we’re related. Fortunately for him, he is the boss :)! I did remind him that people usually don’t spend that much time on someone if they don’t like them – they must really like him because that had to take a whole day out of their weekend! Uh-oh, marshmallow? Who knew – we should track it on ancestry.com!